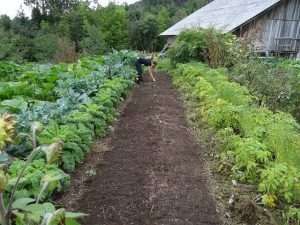 A vegetable garden similar to my grandma’s. My name is Alex, and I grew up on a small family farm with cows, pigs, chickens, and sheep. Of course, we also had cats, a dog, and two large vegetable gardens: my mother’s and my grandmother’s. 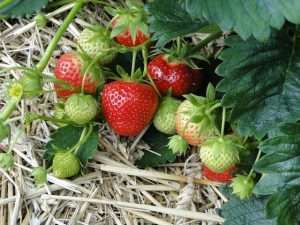 When I was very young, my brother and I were each given a small patch in my mom’s garden, on which we could grow, for example, herbs, a few potatoes, and strawberries. I love strawberries; unfortunately, slugs love them, too. I believe the seeds were sown at that time, seeds that are now bearing fruit with this website, because this page is created out of love and respect for nature. The great wish for a life in harmony with nature is deeply rooted in me, and this page is an expression of this aspiration. A snail plague can only occur when the delicate balances in nature are disturbed. I aspire to show ways that lead back to the harmony of the original horticulture that was created over thousands of years in the gardens of humanity. For many reasons, I believe poisoned slug baits/pellets are not the solution to a slug or snail problem. Do you know anyone who once scattered slug pellets and never needed them again? My experience is exactly the opposite. Once used, you need them over and over again. It’s like a painkiller that makes the garden addicted because poison fights the symptoms but not the causes. The first time I became aware of this was in the spring of 2015. In 2015, I was working in an organic garden in France, which had the beautiful name: ‘Happy Farm’. Unfortunately, we were not happy at that time because our young plants were being threatened by hordes of brown slugs: so-called Spanish slugs. As my bosses did not know what to do to save the young plants, we were spreading slug pellets over large areas of the garden. But that did not seem to help. On the contrary, we found more and more slugs during our nightly ‘slug watch’ sessions. When we went out at nightfall, we would sometimes collect more than a thousand slugs. It seemed the slugs from all over the area were being lured into our garden. For me, this ended in a traumatic experience. One day I was sitting in the garden, and I felt sick to my stomach. My boss and I had watched a slug as it was heading towards one of the blue slug pellets. Addressing the slug, my boss commented, ‘Oh no, do not do that!’ And we both laughed out loud. I realized then that we had crossed a line. We were not just in any ordinary garden. No, we were in the garden of the Buddhist monastery ‘Plum Village’. And what we did was in direct contradiction to the Buddhist principle of nonviolence. Although we were not monks, our behavior went against the general reverence for life that we tried to practice. Would I have joined the resistance, would I have turned a blind eye as so many did, or would I even have participated in the mass murder? It became clear to me that day that I was witnessing and participating in mass murder. The mass murder of extremely peaceful beings. But that was not all. I even laughed about it. That was the moment when I realized how easy it is to become dull. Because slugs that eat the molluscicide iron phosphate do not die immediately. No, they die very slowly after they have eaten the poison. The iron closes their digestive tract, and they cannot swallow anymore. This means they starve slowly over several days. I realized then that this form of death is torture and I knew that I could no longer watch this happening. I could no longer participate, and I felt the urge to resist. So, I tried to find alternatives and to convince the other (un)happy farmers to try something else. But unfortunately, I did not act very skillfully and therefore ran into walls. I was not alone in my criticism, but my bosses did not want to know about it. Ultimately, I left Happy Farm. But during this time the plan to write slug control guidelines for all gardeners and farmers for whom poison is not a solution was hatched. A slug fence can protect plants peacefully. As a result of what happened in Plum Village, I looked for suitable alternatives, and I found many. This website is the result of my research. Here, anyone willing to go another way can find poison-free means to deal with slugs in the garden. 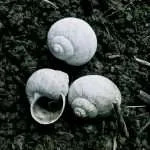 For example, it is possible to effectively exclude snails and slugs from beds by means of a slug fence or by using copper against slugs. 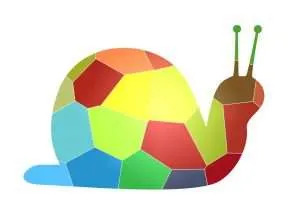 It is also possible to slowly restore the equilibrium between snails, slugs, and their natural predators, as this usually occurs everywhere in nature. 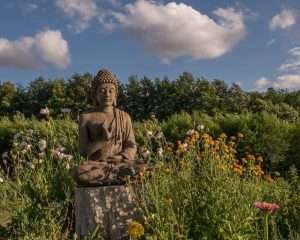 Both approaches can be combined to re-establish the natural harmony of the garden in a nonviolent and peaceful way. On Happy Farm, too, a rethinking has slowly taken place, because the use of poison goes against the Buddhist values of Plum Village. It also became clear there that slug pellets are not a successful long-term solution. They are just a fight against symptoms. 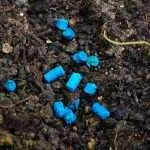 The real causes of slug population booms cannot be resolved but will be intensified if slug pellets are used. I often hear that the Spanish slug would have no native enemies since it would have immigrated from Spain. But this is just one of many myths and fables around the topic ‘slugs in the garden’. 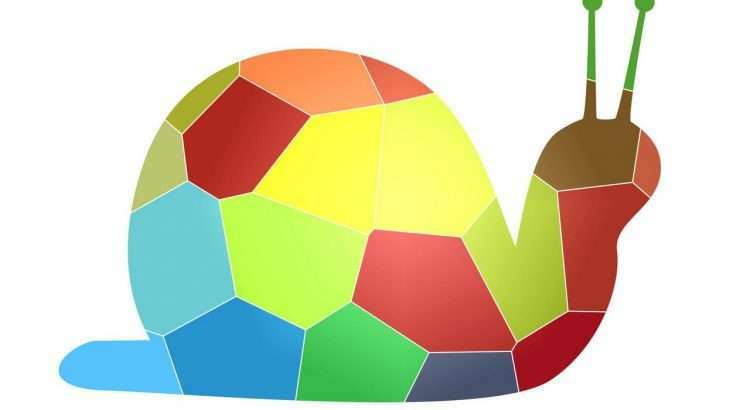 The Spanish slug is Central European, as recent genetic research has shown. And slugs certainly have many enemies. Otherwise, we would not be able to set our foot outside the door without stepping on one of them. So, do not lose hope. 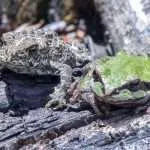 It is possible to settle their enemies – birds, hedgehogs, toads, etc. – and to restore the natural balance in your garden. 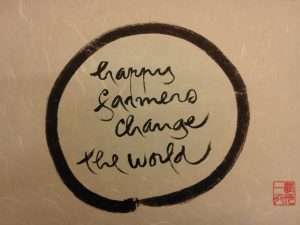 Happy farmers change the world! On Happy Farm, they have an advantage, because a lot of fireflies still live there. And fireflies are one of slugs’ and snails’ worst enemies. But unfortunately, they are susceptible to light smog and insecticides. That is why in most places fireflies are already extinct. And once extinct, reintroducing them to an area is complicated. 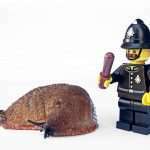 Fortunately, many other insects – such as ground beetles, flies or harvestmen – like to eat slugs. 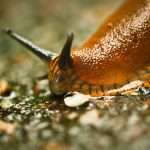 The extinction of insects in many places and the rise of slugs and snails seem to be secretly connected. 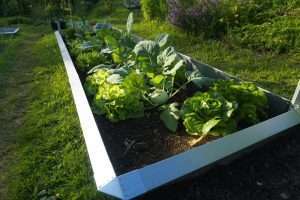 That is why one of the best measures against slugs is the resettlement and protection of insects. Click on the link for more information about how to promote biodiversity in your garden. All information on this website is free. But the project is financed via affiliate links. This site must somehow finance itself, and this is a simple way of doing so. I sincerely apologize to anyone who does not like that. Maybe in the future, this will no longer be necessary. This site was launched with a lot of passion, care and time. 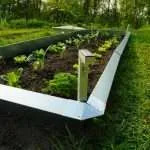 Hopefully, it will help many gardeners in a way that is successful and sustainable. And may you and your garden be healthy and happy so your harvest will be joyful and rich!